Wishing all a peaceful and healthy New Year. I chatted this week with the lovely Mel Schuit about my latest book, Shy, on her blog Let's Talk Picture Books. 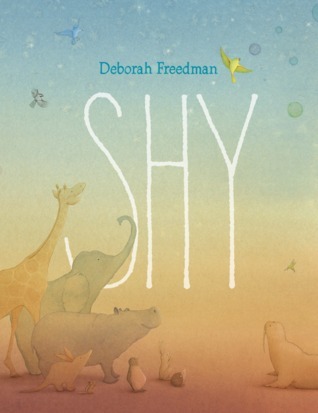 I've made no secret about how much I love Deborah Freedman's latest picture book Shy. In fact, I might be a little TOO excited about it: I've talked about it here on Let's Talk Picture Books, as well as on Instagram, Twitter, and everywhere else people will let me stand on a soap box and rave about it. And now I get to share her process with you!! You can read the rest of the interview here. Thanks, Mel! "Shy was happiest between the pages of a book... "
Jeremy Draws a Monster by Peter McCarty. “Jeremy lived on the top floor of a three-story apartment building… He never left. He never went outside.” Until one day, when he decides to draw a monster — which, humorously, threatens to take over Jeremy’s life. This is a deceptively simple book, in which the text and gently witty illustrations leave plenty of space for readers to discover an unspoken connection between shyness and imagination. Amandina by Sergio Ruzzier. “Amandina was a wonderful little dog… But nobody knew that, because nobody knew Amandina.” Then one evening, this quiet actress, singer, and acrobat “promised herself that she would stop being so shy.” And that is when Amandina bravely attempts to connect through her art, and along the way, she helps us to understand how touching even one, small creature can open up a whole world. Shy Charles by Rosemary Wells. Pity the poor child whose parents are as unsympathetic as Charles’s. Or admire Charles, who resolutely refuses to change in spite of them, and by the end of the book has taught the adults around him something that young readers have probably already intuited: he was strong all along. The Boys by Jeff Newman. In this wordless book, a boy is too shy to approach kids playing ball in his new neighborhood. So instead, he sits down on a park bench with a bunch of old timers. He goes back day after day, humorously turning into one of them — trading his cap for slicked back hair and a derby hat, his shorts for plaid pants and bowtie, his baseball bat for a walking stick — until one day, when they aren’t there. Then, in a neat and sweet bit of role-reversal, the oldsters wisely teach one youngster how to be a proper whippersnapper. Simple, expressive, and subtly affecting. Raymie Nightingale by Kate DiCamillo. One reading friend has suggested that the character Raymie Clarke might like my new book, SHY. Naturally, I'm ridiculously flattered by this suggestion, although I don't know how Raymie would feel about it. But I do know this: if given the chance, Shy would love her — and Kate DiCamillo — right back. It has become my favorite way to launch a book: on September 27th, to celebrate the publication of my latest book, Shy, I skyped with several hundred children, from Connecticut to Alberta to Hawaii and states in between. Many, many thanks to the wonderful teachers and school librarians who participated and made these visits possible! I could not have asked for a better Book Birthday. In today's post on All the Wonders' Children's Book Podcast, school librarian Matthew Winner interviews me about my new book, SHY. Thanks as always to Matthew, for a wonder-ful conversation! Hello, book nerds. Today I have a post up at the blog, Nerdy Book Club! Read more, in my September newsletter. Karlin Grey, the debut author of Nadia: The Girl Who Couldn't Sit Still, writes a weekly blog about picturebook writers and their first books. Today, she interviews me about my first book, Scribble. You can read the whole interview here. To go along with Karlin's interview, here are a few images — along with many thanks to Karlin for allowing me to revisit Scribble! To a Book Birthday Party! My favorite Book Birthdays have been spent with readers, and the more, the better! That is why I am hoping that your classroom, library or homeschool group (of 10 or more) would like to help me celebrate the release of my next book, SHY, on Tuesday, September 27th, via Skype. Kids always ask, “where do get your ideas?” My answer, + the first few pages of SHY, all in my latest e-Newsletter. Confession: I am a compulsive list-maker. I love making to-do lists and find crossing items off with a fat, black marker ridiculously satisfying. But some lists have a way of growing and never shrinking, and my to-read list is the worst of those. So for that, I use Goodreads. It helps me keep my reading life organized in to-read, read, and a bunch of other lists of my choosing. I don’t rate new books there and have chosen not to add books that I really didn’t like or felt ‘meh’ about, but I do make occasional notes about books I’ve enjoyed, and I love seeing what others are reading and recommending. Oh, and one more thing about Goodreads? GIVEAWAYS. Giveaway ends September 27, 2016. It's all about experimentation: splatter painting à la Blue Chicken, with liquid watercolors, drinking straws, and old toothbrushes, at nErDcampMI Jr.
You can read more about the fabulous nErDcampMI, 2016 edition, here. Thank you, Kirkus, for SHY's first review! Freedman’s fine pencil lines, graceful animals, superb compositions, and spare text are virtuosic, but the backgrounds are the soul of Shy’s tale: breathtaking watercolor washes blend hues softly from one section of the natural color spectrum to another, opaquely connoting desert, mountains, skies, dawn, and night. An exquisite treasure for bashful readers, animal lovers, and anyone who’s ever wanted a friend. Get a sneak peek at six of Penguin's favorite books coming out this fall! 1st up: SHY, by yours truly. Find the full story at penguinsneakpeek.com. Take a look at this wonderful post on Happy Birthday Author to see two adorable children scribbling and painting — and find out how to make your own Blue Chicken splashes! The Cotsen Children's Library at Princeton gets crafty, just in time for Spring! Instructions here: at Pop Goes the Page.
. . . to my new website! I hope you like the new digs and will take a look around — at gobs of information, resources for readers and writers, and pretty pictures. Visit this page for news updates, and for anyone who enjoys the occasional email newsletter with "sneak previews" and suchlike, it's easy to sign up. Another interview! This time with illustrator "Dani Duck: Artist Obscure", in which we chat about making dummies.